Backed by the MSO, lead singer Brody Dolyniuk and his Queen tribute band symphonically resurrected Freddie Mercury's music at the Riverside. It was very confusing at first. What was my role as an audience member? To sing with wild abandon and jam on my air guitar, or to quietly revel in the power of the MSO? Thankfully, lead singer Brody Dolyniuk and conductor Brent Havens made it clear that we were expected to rock. The show started with “Tie Your Mother Down,” a perfect song to launch the night into the sing-along rock show it was meant to be. Dolyniuk did not attempt to look like the late, great Freddie Mercury. At first this seemed unfortunate, but the danger of turning tribute into parody runs high in costume. His voice was enough, a near-exact replica of Mercury’s range and iconic sound. The first few songs almost certainly left the MSO fans wanting. “Play The Game” and “I Want It All” swallowed the orchestra, with Havens’ tribute band creation cramming the theater with pure classic rock power. That’s not necessarily a bad thing, but it was a little frustrating to see the orchestra right there, bows furiously moving up and down behind the band, and barely hear what could only be fearsome, incredible accompaniment. Eventually a balance occurred, and it was magical. Favorites “Under Pressure” and “Killer Queen,” performed back-to-back, brought the MSO’s sound to the forefront. Even the crowd’s ferocious sing-a-long-ing (“She’s a killer queeeen!”) couldn’t compete with the dynamic force occurring on stage. Surprisingly, “Stone Cold Crazy” had the same effect. What should have been another hard-rock takeover by the tribute band instead saw the MSO breaking a sweat, challenging the electric guitar to match them. The MSO received some standing ovations after “Who Wants to Live Forever” (which Dolyniuk made sure to introduce as the song from the film adaptation of Highlander), unquestionably their most beautiful performance of the evening. However, it was more fun to hear the MSO contribute to songs like “You’re My Best Friend” and “Fat Bottomed Girls.” “Who Wants to Live Forever” was built for an orchestra. Hearing them take on Queen’s catchy, pop hits was exciting because it was so outside their general repertoire. No Beethoven, Handel, or Tchaikovsky – only Mercury, fantastically re-imagined. Another favorite of the evening, “Somebody to Love,” highlighted the plain old good times shared by Dolyniuk and Havens. Dolyniuk jumped down and joined the masses for the crescendo while Havens turned to conduct the crowd. Nothin’ better. You can imagine the energy that rained down when the full force of Bohemian Rhapsody hit the audience. The MSO was at maximum volume, Havens’ hands flew, the band rocked relentlessly, Dolyniuk became Freddie Mercury. That wasn’t even the finale – “We Will Rock You” leading into “We Are The Champions” closed out the evening – but it typified the evening. It’s safe to say MSO fans and Queen fans alike rocked out on air guitars on the way home, or at least sang out “Galileo” in a dozen strange Mercurial voices. This show was FANTASTIC!!! 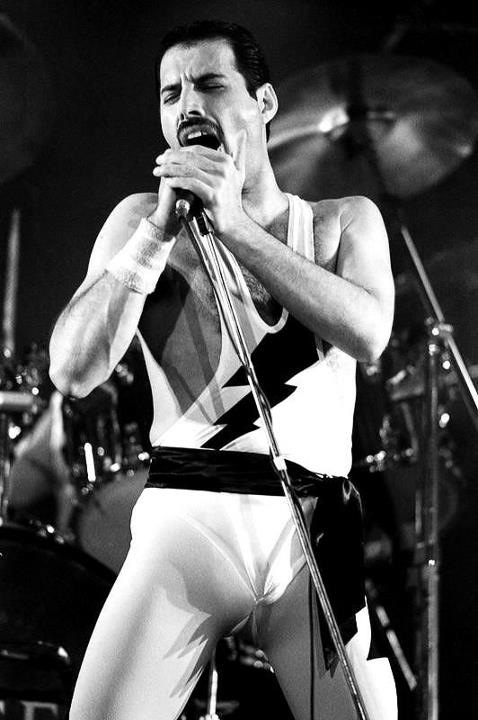 I am a die-hard Queen fan & I thought there was no way Brody would be able to replicate (SO WELL, might I add) the vocal perfection of Freddie Mercury. Absolutely one of the funnest concerts I have EVER been to! I was insanely excited that “Who Wants To Live Forever” was put into the set list!!! One of my top five favorite songs! It is beautiful, yet…every Queen song is beautiful! Brody, you thoroughly deserved the standing ovation you received from our entire audience!!! As well as MSO!!! GREAT, GREAT JOB EVERYONE!!! Excellent show! The only thing that I would have liked better, would to have been sitting on stage with the MSO. The music was fantastic. What a lovely night indeed.